Back when I did my own research to understand my serious health problems, I was shocked by the harmful foods I had been consuming in my first thirty years of life. Awareness of the damage these acid-forming foods were doing to my body, gave me the motivation to change my diet and eating habits. Today’s modern diet is often desperately lacking in nutrients compared to that of our ancestors. With advancements in technology, many foods are manufactured, genetically re-engineered, and processed. Manufactured and processed foods are harmful and create an acidic environment in the body ideal for diseases to thrive. Our busy lifestyle means that we often rely on instant meals and cheap snacks. We spend less time preparing and eating the fresh whole foods the human body was designed for. Each time you consume any of the harmful acid-forming foods listed below, you slash a few hours off your life. What Are Acid-Forming Foods And Why Are They Bad? The pH scale measures acidity: pH 0 is a highly acidic, pH 14 is a strong alkaline, whilst pH 7 is neutral. To operate effectively and remain disease free, the optimum pH of human blood is 7.4 (slightly alkaline). The food we eat changes the acidity of our blood. Once in the body food can be either acid-forming or alkaline-forming. Note that acidic foods are not necessarily acid-forming in the blood, for example, lemons are very acidic (pH 2-3), yet have an alkalizing effect in the blood. When we eat acid-forming foods, they cause our blood to become acidic and vice-versa. What causes an acidic environment in the body? Eating too many acid-forming foods, build up of toxins, stress, lack of exercise all contribute to acidic environment in the body. Why are acid-forming foods bad for you? The body works to neutralize the acidic state caused by acid-forming foods by using alkaline minerals, this is known as pH buffering. Tumor cells, many bacteria and virus’s thrive in an acidic environment. One of the ways the body neutralizes or “buffers” acid-forming foods is by taking calcium and magnesium from your bones, teeth and muscle, which can eventually lead to osteoporosis. Poor absorption. An acidic environment decreases the body’s ability to absorb vitamins and minerals. Energy production in our cells is less reduced in an acidic environment causing fatigue. An acidic environment decreases the body’s ability to repair damaged cells. Detoxification is less efficient in an acidic body results in a build up of toxins. Acidic blood is thicker and slower moving, so less effective at taking nutrients and oxygen to cells, and removing toxins. Thick blood “hosts” a myriad of harmful organisms (bacteria, virus, parasites and yeast). Over time, it begins to clog up the detox organs. 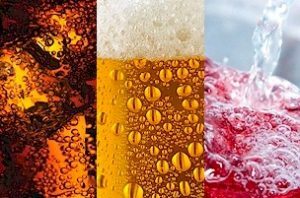 dairy products, carbonated drinks, medication, sugary products, table salt, refined flour, red meat, refined vegetable oils, deep-fried foods, artificial food additives. Pasteurization is a process invented in 1864 where food is heated to a high temperature to kill microbes and allow it to keep for longer without going off. Similarly ultra-high temperature (UHT) heats food to an even higher temperature (160°) but for a shorter period of time. However, both pasteurization and UHT of dairy products denatures proteins, destroys enzymes and beneficial bacteria, reduces vitamin content, destroys vitamins B6 and B12 and promotes pathogens so the milk or food has lost its beneficial properties and cannot be assimilated by the body. 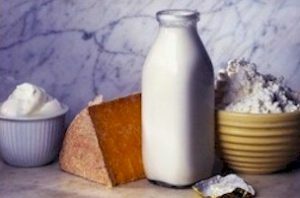 Why are pasteurized dairy products bad for you? If you are turning to cow’s milk for calcium, you are mistaken. Cow’s milk is not a good source of this calcium. Milk (and dairy products) are acid-forming in our body. The body tries to balance the pH by drawing more calcium (alkaline) from our bones, which eventually leads to osteoporosis. During pasteurization dairy proteins are denatured and cannot be assimilated by the body. Consumption weakens the immune system, causing allergies and many other problems, like asthma, nasal congestion, skin rash, chest infections, higher blood cholesterol, increased risk of heart disease and stroke. Crib or cot death has even been attributed to cow’s milk allergy. When you consume cow’s milk, it causes excessive mucus to be formed in the lungs, sinus and intestine, which hardens to form a coating on the inner wall of the intestines, leading to poor absorption of nutrients, constipation and endless potential health issues. Imagine the havoc cow’s milk can do to an infant. No wonder asthma and bronchitis are so rampant in our young children! Seeds, nuts and crunchy vegetables like broccoli, cabbage, carrots and cauliflower are all great sources of calcium. God has designed mothers to feed babies with breast milk. But in these modern days, mothers are too busy that we have resorted to cow’s milk, bringing up a generation of sickly children who have weak immune systems. If breast milk is not available, use goat’s milk, rice milk or almond milk. Read: Why milk is bad for you, and healthy alternatives. If you drink soda and carbonated drinks regularly, you would do yourself a great favor to gradually eliminate them from your diet. A can of fizzy drink contains up to 15 teaspoons of sugar, 150 empty calories, 30 to 55 mg of caffeine, is loaded with harmful artificial food colors, flavorings and preservatives, and contains zero nutritional value. Some soda drinks are “disguised” as “diet soda” where dangerous sweeteners like aspartame are added. Some are marketed as “energy drinks” and give an instant but short-term energy boost. Once the initial kick wears off, energy levels dwindle and you may crave another can. This can eventually lead some people to get hooked. Why are soda and carbonated drinks bad for you? Numerous health side effects are associated with aspartame ingestion, including brain damage, diabetes, emotional disorders, decreased vision, ringing in the ears, memory loss, heart palpitations and shortness of breath. The high sugar content level in sodas leads to many health problems and suppress the appetite for nutritious foods. This results in nutritional deficiency. Regularly drinking high sugar drinks leads to tooth decay. As part of a healthy, holistic lifestyle you should drink the correct amount of water each day to quench your thirst. For an instant energy boost, fresh fruit juices are a healthy and nutritious alternative. Read: Soft Drinks: What You Don’t Know Can Kill You. 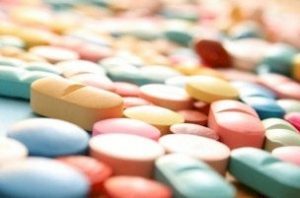 If you are on any medication, it is acid-forming and causes your blood to thicken. You may even be prescribed another medication to “thin” your blood but this can cause stomach ulcers. A third drug may be prescribed to “counter” your ulcer, but may cause you constipation. Constipation will cause you a many other health problems and so the downward spiral continues. The upshot: your immune system is compromised and other diseases may surface, such as, diabetes, high blood pressure, poor circulation, high cholesterol and yeast infection. You keep getting prescribed more and more medication for each problem. Do you see the vicious cycle? Find a physician who understands holistic health and discuss how to reduce your medication. Begin by eating more alkaline-forming foods. Take control of your own body and your own health! The human body is designed to run primarily on complex carbohydrates from whole grains, vegetables, beans and pulses. 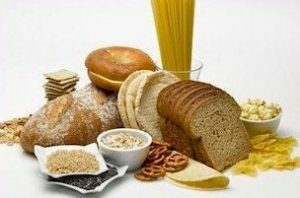 Complex carbohydrates are broken down by the body throughout the day, providing a steady supply of energy to the body. 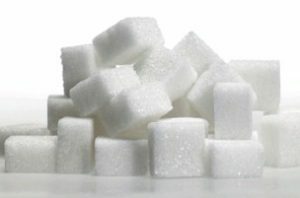 We also get a second type of simpler sugar, fructose from fruits, though this only gives short-term energy. However, technology has allowed us to extracted the sweetness in the form of refined sugar, but leaving behind all of the nutrients. Refined sugar is lethal for human consumption because it has been depleted of its life forces, vitamins and minerals. Sources of simple sugars such as white sugar, brown sugar and glucose, release glucose almost immediately into the blood stream causing a rapid increase in our blood sugar levels. If this sugar is not required by the body, it is stored as fat. When the blood sugar level rises, the pancreas releases insulin into the blood stream. Insulin is a hormone that helps regulate the level of blood sugar. When we consume food that releases sugar fast (high glycemic index), our body over-reacts to the increase in blood glucose by producing more insulin than necessary. As a result, blood glucose falls too much within a short time, causing you to feel hungry again. When you respond to that hunger by eating another high glycemic meal, it sets off another up-down cycle in the insulin level. Over time, these exaggerated rise and falls in the insulin level will lead to a reduction in the body’s ability to respond to insulin and the development of a condition called insulin resistance. When this happens, the glucose level in the blood system remains constantly high. The pancreas responds by producing more and more insulin to try to maintain the sugar blood level, until it can no longer keep up. This condition is directly damaging to the cells and can cause severe long-term damage to the body. Common health problems that are related to this condition are insomnia, obesity, type-II diabetes, polycystic ovary disease, cardiovascular disease, high blood pressure, and hormone related cancers. Do not be deceived and use artificial sweetener. They mostly contain aspartame that are more damaging than refined sugar. The best way is to not actually consume refined sugars at all. You can ween yourself off by cutting down on sweet foods such as cakes and pop, and avoid adding too much refined sugar to your cooking, tea and coffee. Stevia is a much healthier plant-based alternative to sugar. Read: Early Warning Signs That Your Body Is Overloaded With Sugar. The salt I’m referring to here is manufactures table salt (sodium chloride), as opposed to far healthier alternatives such as sea salt, which is packed with other minerals. Although the body needs sodium, it must be in an organic form to be useful. Refined table salt, sodium chloride, is an inorganic sodium compound that is toxic and causes the body to retain fluid. Why is table salt bad for you? Refined salt is highly acidic in the body. High intake of sodium chloride thickens and stiffens arteries and increases the risks of strokes, and heart attack. Table salt accelerates the rate of renal functional deterioration. Sodium chloride draws calcium from your bones, which is excreted in the urine. This leads to early and painful osteoporosis, or the thinning and fracturing of your bones. Sea salt and rock salts are 100% natural; alkalizing on the body; and packed with other essential minerals such as iron, magnesium, potassium, iodine and zinc. Here is a comprehensive list of healthy alternative salts. What is white flour and how is it produced? White flour is manufactured from whole grain wheat. The bran and germ (which contain almost all of the nutrition) are removed and discarded, before the flour is bleached with a deadly chemical called “alloxan“, which also destroys the beta-cells of the pancreas, a cause of type 2 diabetes. Finally, coal-tar-derived, carcinogenic vitamins are added and sold to the unsuspecting public as “enriched” flour. Why is white flour bad for you? White flour makes your blood sugar rise more than refined sugar. It is hard to chew and very low in fiber, putting pressure on the digestive system. Intestinal infections are a direct outcome of white flour consumption. Used to bleach white flour, alloxan destroys the beta-cells of the pancreas, a cause of type 2 diabetes. Wheat bread has recently been introduced as the “healthier option”. Do not be deceived. Studies have shown that wheat is contaminated with a germ called mycotoxin. Consumed in high amounts, mycotoxin can be lethal and has been reported to cause rheumatoid arthritis, miscarriage, headaches, infertility, slow growth development in children and irritable bowel. Moreover, wheat converts to sugar rapidly and accelerates aging in people with low metabolic rate. Be wary of things made from flour, e.g. bread, cakes, pancakes, pasta, etc. If you must eat them, eat them sparingly. “Foods” made of flour has no nutritional value at all, and cause more harm to your body than good. Combine this with sugar and high heat baking, you have the perfect combination to all kinds of degenerative diseases. A balanced diet should contains a variety of wholegrain cereals such as barley, rice, millet, spelt and quinoa. Read: The shocking truth why bread is bad for you. But, if you really must eat bread, choose Ezekiel bread. Most commercially produced meat today, whether chicken, beef, pork or lamb, has received multiple hormone treatments: to make the animal grow quicker, to increase milk production and to make the meat more tender. Antibiotics are also used widely on animals to prevent infection and to enhance growth — to produce cheaper meat and higher profits. I will mention but not go into the health and ethical issues of eating battery farmed animals over free range or wild animal in this article. Why is eating too much red meat bad for you? Meat proteins are acid-forming in the body. Most of us are in danger of too much protein intake than too little. Excess protein is a contributor to osteoporosis, acidity overload of the kidneys and increased risk of kidney stone formation. The hormones found in meat are estrogen-dominant and have been linked to breast cancer, fibroids, endometriosis as well as ovarian and cervical cancer in women. In men, the common symptoms are prostate and testicular cancer, loss of libido, impotence and breast enlargement. 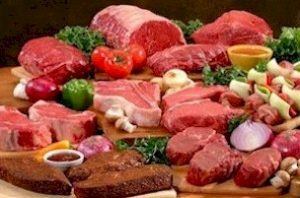 Meat has been linked to diseases of the digestive system, heart disease and cancer of the stomach and colon. Antibiotics found in non-organic meat can enter the body. Eating lots of meat puts stress on the digestive system. Plant proteins are also acid-forming but are more easily assimilated when compared to animal proteins. Healthier protein rich foods are small or fresh water fish, beans, lentils, bean curd and whole grains. Try to eat organic where possible. If you must eat meat, try to avoid beef and pork, or consume no more than three portions a week. Aim for natural organically produced meat from mountain animals left out to pasture. Such animals have a diet of fresh grass and medicinal mountain flowers! Read: Why You Should Eat Only Grass-Fed Meat. Our body needs essential fats. However, not all oils are created equal. This article explains in more detail about the various types of fats—those that are healing, and those that are harmful. Why are some oils bad for you? For a long time now, these all vegetable cooking oils have been mistakenly regarded as the “healthier” choice, but experts now recognize this fatal mistake. Vegetable oils are heavily refined and processed when making them into cooking oils, rendering them toxic. After processing the oils oxidize resulting in the formation of transfats and damaging free radicals (this is a process called hydrogenation). The truth is, coconut oil which have been regarded as unhealthy is the better choice for cooking. Unlike most unsaturated oils, coconut oil does not turn toxic when cooked. Extra virgin olive oil (preferably cold-pressed) is great for light cooking and sauteing; but for high heat cooking, these oils are recommended: avocado oil, coconut oil and ghee. Also Read: A Critical Look At Vegetable And Seed Oils: Good or Bad? While many of us know that fast foods are bad, we don’t know just “how bad” they are, to stop eating them. We spend our hard-earned money on the very things that are killing us, then our lifetime savings on medical bills. 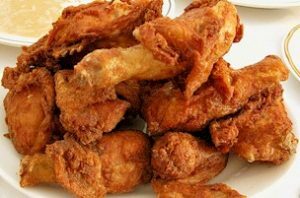 Why are fried foods bad for you? Heated oils are acid-forming in the body. Frying at high temperatures produce oxidants that cause cancer. Scientific research has found a cancer-causing substance called acrylamide in foods cooked at high temperatures. While the safe limit set for acrylamide in food is ten parts per billion (ppb), French fries and potato chips are found to contain more than a hundred times this amount! Acrylamide is produced when foods are browned or burnt, or cooked or processed using high heat. These methods include frying, barbecuing, baking, and even by microwaving. Steaming, quick stir-fry or blanching are all healthier ways to cook foods, ensuring they do not contain oxidants as the food is not burnt. I’m not saying don’t eat acid-forming foods: just eat them in smaller amounts whilst eating more alkaline-forming foods. As a rule of thumb to avoid an acidic state within your body, cut down on foods that contain refined grains, refined sugar and artificial sweeteners, red meats, gluten, dairy and fried foods. Alkaline forming foods are generally raw, whole foods such as fresh fruit, vegetables, greens, seeds, nuts, beans, pulses, lentils, herbs and spices. Remember, a healthy stress-free lifestyle with plenty of exercise is also key to creating the right alkaline balance within the body to keep your illness and disease-free. Find out more from the alkaline food list.